My great grandfather was a professional gardener in the English countryside. His profession was passed down as both a hobby and passion to my grandparents, and next my father. Growing up in the Chicago suburbs I had little interest in undertaking the family tradition, but after moving to Colorado and studying about the environment I have gradually gained interest, hoping to learn more. 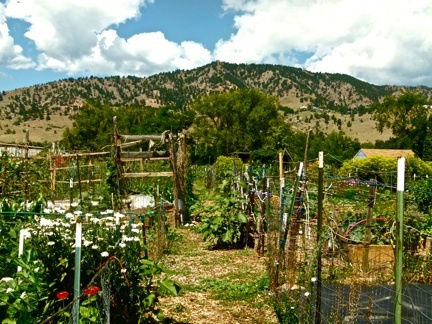 I was very curious to visit Growing Gardens, a Boulder organization that promotes environmentally sustainable gardening programs, emphasizing community participation and education on their eleven acres of farmland in North Boulder. As soon as I stepped onto the property, I saw how glorious it was; seemingly endless rows of crops and flowers poised against the beautiful backdrop of the Flatirons, peacefully tucked away from the usual hustle and bustle of Boulder. The place was quite active for 9 a.m. on a Tuesday, full of diverse groups of people and all age working side by side in the greenhouse, attending to the garden plots, and harvesting. Everyone welcomed me in as a first-timer, enthusiastically showing me around and giving me introductions. My assigned task for the next three hours was weeding one of the pathways that needed re-mulching. Admittedly, I was a little disappointed with this job at first, weeding being one of the ‘less glorified’ aspects of gardening. Nonetheless, I grabbed a pitchfork, hesitantly pushing it into the soil in an attempt to uproot the weeds. I haven’t had much previous gardening experience, and was slightly apprehensive that I might not know what I was doing, or tire easily. However, it only took a few minutes of feeling around and examining the soil with both my hands and the pitchfork before I got the hang of the weed removal for that particular ground. It had rained heavily the night before, and the most of the weeds gave way rather easily, their roots having a weak hold within the soil. It almost felt as if I were doing the earth a favor, and that it was glad to be rid of the invasiveness of the weeds. Working under the mountain morning sun, I lost track of time as I became immersed in what I was doing. My mind slowly quieted its usual loud chatter as I focused on my connection with the earth, reaching a more peaceful, meditative state of mind. Afterwards, the greenhouse manager and volunteer organizer, Lauren, was kind enough to give me a personal tour around the property, teaching me more about Growing Gardens and their various projects. 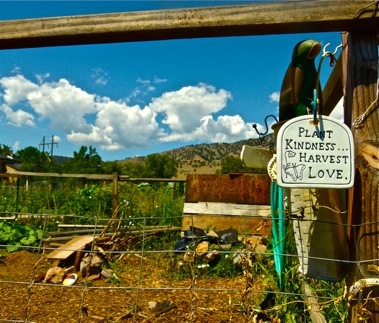 Growing Gardens stated mission is to “enrich the lives of Boulder County residents through environmentally sustainable gardening programs that empower people to experience a direct and deep connection with plants, the land and each other,” and 85% of their time and effort is focused on community outreach and education. They are a multi-dimensional organization that is comprised of four different urban agricultural projects that emphasize different themes such as youth involvement, horticultural therapy, and community. Although seemingly small, Growing Gardens is a symbolic solution to the food issues and environmental degradation our world faces today, by promoting food security and access to locals, energy saving, and caretaking of the land. I then wandered around and explored by myself. Distancing myself from the others, I was better able to feel the mysterious spirit of the plant world surrounding me. Plants truly are amazing organisms; being more than 95% efficient at transferring energy and making it possible for all other creatures to exist, and possessing great healing powers that make up the foundation of the majority of our medicines. It’s fascinating to think about how much goes on that we don’t yet understand, and if plants really do have a sort of consciousness that dictates their inner workings. I would say I did my family proud as I definitely got in touch with my own “inner-gardener” that morning. I was also reminded how awesome I feel after being outside and working with nature, and felt even stronger and more excited about my decision to begin my graduate work in Environmental Leadership this fall. The human-nature connection and positive vibrations emanating from Growing Gardens are undeniable, and they can be seen not only in the happy faces of the people working there but felt in the land itself. I highly recommend taking the time to volunteer a few hours at Growing Gardens, and I know I’ll be back there sooner than later! 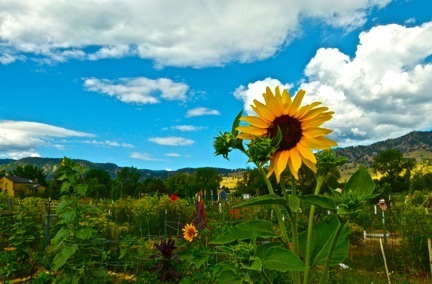 Editor’s note: Saturday, August 4 is the 13th Annual Cultiva Farm to Table Dinner. It is a fundraiser for Growing Gardens. You can purchase tickets at GrowingGardens.org.